I'm still on the never ending quest to find drinks my wife will enjoy. In the meantime, I get to review all sorts of random stuff I buy, thinking she'll like it, only to end up with a mostly full bottle that I'm left drinking by myself. She'll still drink Coca Cola mixed with Disaronno, but that's about the only thing she'll have consistently. 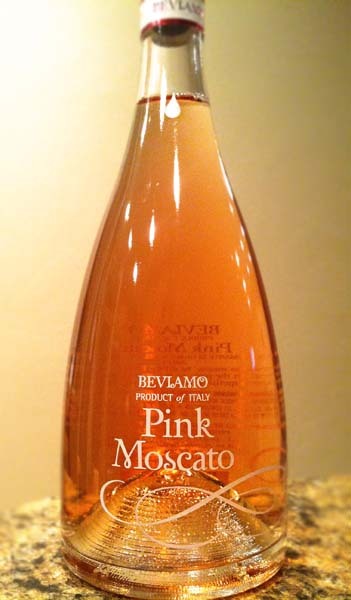 So, here's a review of the Beviamo Pink Moscato! Beviamo's Pink Moscato is actually a sparkling wine, and I'm really happy to see it's not the crazy artificial pink color a lot of newer Pink Moscatos are. I'm not sure what the deal with this wine is. I know Beviamo makes a few wines that are widely distributed, but for some reason currently this sparkling Pink Moscato is sold pretty much nowhere except Sam's Club. Odd, I know, but oh well. The Beviamo Pink Moscato has a good level of carbonation, just slightly less than most champagne. It smells of ripe peaches, melon, and hints of roses. Tasting is a lot what you'd expect: light honey, peaches, and some sweet floral notes. All in all, a pretty tasty Pink Moscato. Not the best I've had, but far from the worst. My wife said she enjoyed it, but she ended up only nursing one glass over the course of several hours which left the remainder of the bottle for me to drink. Apparently she didn't like it that much, oh well. I do love the shape and look of the bottle, though! For a girly drink, it's really not too bad. Drink This: if you want an above average Pink Moscato that's pretty damn tasty and not overly sweet. Don't Drink This: if you don't want diabetes. Just kidding, it's not that sweet, unlike some pink moscatos.